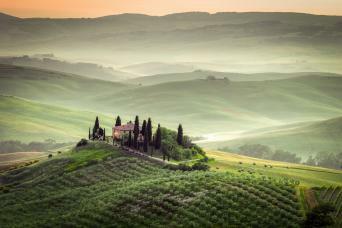 Cycling in Tuscany will allow you to immerse yourself in (arguably) the most dramatic and passionate region of Italy. Bike on quiet roads over rolling hills through the heart of Tuscany. 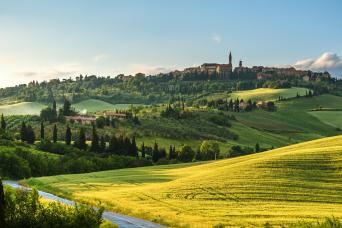 Gorgeous golden hillsides, rich artistic heritage, gentle biking paths and great food and wine at the end of a day’s cycling make this tour a perfect mix of what makes Tuscany great. Choose the best cycling in Tuscany tour for you; from cycling Tuscany: Chianti & Siena, Florence to Montepulciano or Pisa to Florence, our tours are sure to offer an authentic Italian experience on two wheels. With our wide range of cycling tours in Italy, we are sure you will be returning again soon. Discover quintessential Tuscany on two wheels. From the world-famous city of Pisa and its iconic tower, you pedal through the Tuscan landscape, past scented vineyards and verdant olive groves towards Florence: birthplace of the Renaissance and city of timeless beauty. 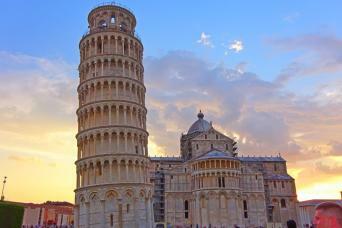 Experience the very best of classic Tuscany on a self guided cycle tour. 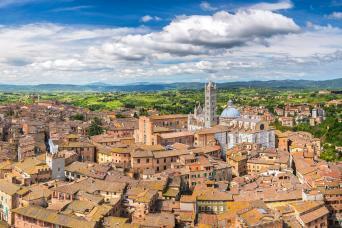 Take to two wheels and cycle bella Italia, discovering picture-postcard Medieval and Renaissance hill-top villages as well as must-see Siena, accompanied by sumptuous cuisine and the famed Chianti, Brunello and Nobile wines.